Baba Banda Singh Bahadur established the first independent Sovereign State under Sikh rule, with its own coins and seal. Although it was short-lived, it put the Sikhs on the path to establish their own Empire in the Punjab (which was subsequently occupied by the British and hindu Indians by treachery). Sri Gokal Chand Narang writes in his book, Transformation of Sikhism that the personal magnetism of Baba Banda Singh Bahadur was too great for the mughals to ignore, as his undaunted courage and extraordinary valour knit his followers closely to him. The fact that, out of thousands that were captured and executed by the Mughal Government, not even a single Sikh renounced his faith to save his own life. This was due, in no small part, to the extraordinary character and Sikh values of Baba Banda Singh Bahadur. Mohammad Amin Khan, the author of Siyarul-Mutakherin, asked Baba Banda Singh Bahadur why he was waging war against the mughals. Baba Banda Singh Bahadur replied, "In every faith and every land, whenever men have become corrupt, despotic and tyrannical, God sends a scourge like me to punish them and teach them a lesson". Baba Banda Singh Bahadur created the first independent Sikh State at this location in Lohgarh, previously known as Mukhlis Garh and Mukhlispur. After capturing Sirhind in 1709, Baba Banda Singh Bahadur captured Sadhaura in 1709 and then made Mukhlispur the capital of first Sikh Empire. Lohgarh was established where Mukhlisgarh Fort had been built by Shah Jahan and fortified further. The old fort of Mukhlispur was built by Mukhlis Khan, an Emir of Shah Jahan, as his summer resort. It is situated on an elevated summit at the steps of Himalayas, about half way between Nahan and Sadahaura about 21 miles from Sadhaura and within boundaries of village Ammuwal. It could only be approached through rocks and ravines. The old fort was repaired by Baba Banda Singh Bahadur and given the new name of Lohgarh or Iron fort. It was surrounded by two rivulets Pamuwali and Daskawali, originally forming one river. Baba Banda Singh Bahadur issued Khalsa currency from Lohgarh, a coin in the name of Guru Nanak Sahib Ji and Guru Gobind Singh Ji with Persian inscription "Sikkah bar har do alam tegh-i-Nanak wahib ast, Fateh Gobind Singh Shah-i-Shahan Fazal-i-Sacha Sahib ast". Which means "Coin struck in the two worlds by the grace of True Lord; Victory to Gobind Singh, the King of Kings; the sword of Nanak is granter of desires". Baba Banda Singh Bahadur also had a royal stamp inscribed "Degh Tegh Fateh Nusrait-i-Bedirang Yaft az Nanak Guru Gobind Singh". Which means "The kettle (symbol to feed the poor), the sword (symbol of power to protect the weak and helpless) the Victory and unhesitating patronage has been obtained from Nanak Guru Gobind Singh." After the mughals and the forces of the Nahan State repeatedly attacked the fort at Lohgarh, Baba Banda Singh Bahadur left Lohgarh in 1715 in search of a more secure loccation. Presently there are only ruins of the fort in form of a few stones. 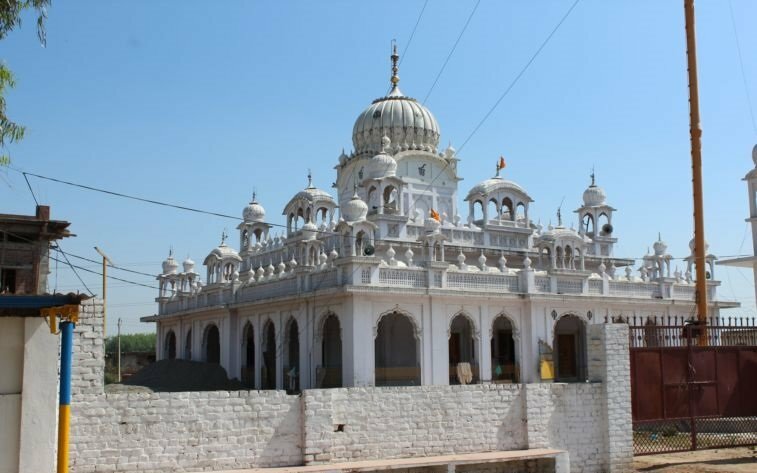 Gurdwara Sri Baba Banda Singh Bahadur Chapar Chiri is situated between the two villages of Chapar Chiri (one large, one small) by the side of the link road joining them. 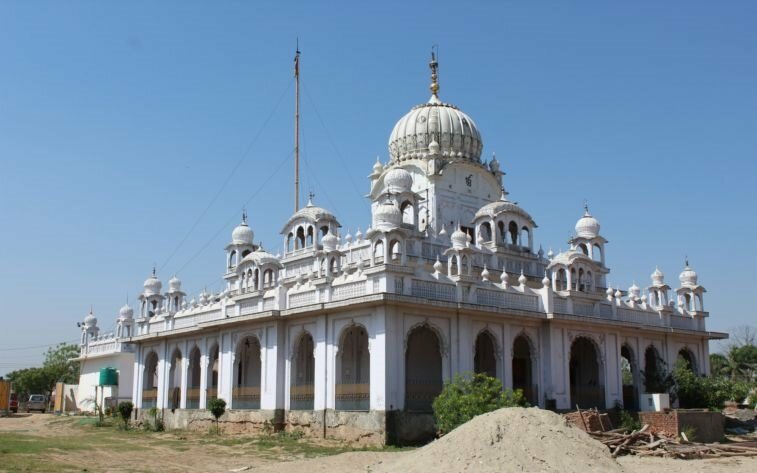 Chappar Chiri is known as the location for the historic Battle of Sirhind between the Sikhs led by Banda Singh Bahadur and Wazir Khan, a mughal child killer who was responsible for the interrogation and execution of Sri Guru Gobind Singh's youngest sons. The battle took place on 12th May 1710, Wazir Khan was killed and the mughal army routed. The Sikhs occupied Sirhind on 14th May 1710. No memorial, however, existed to commemorate the historic event till the 1950's when the two villages jointly established a Gurdwara. In the 1970's a new darbar was added in which is the Guru Granth Sahib. The old Gurdwara building is now being used as a primary school. Another small room constructed has the Baba Banda Singh Bahadur library. The Gurdwara is managed by a committee representing the two villages. 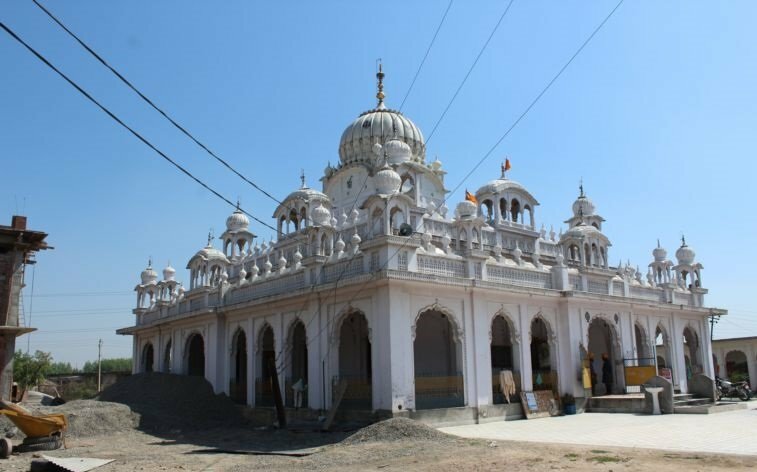 The village of Gurdas Nangal is associated with Baba Banda Singh Bahadur's last battle with the mughals. In April 1715, Farakh Seyer the new emperor of hindustan, ordered all his governors in North India that Baba Banda Singh Bahadur should either be killed or arrested. He taunted the Governer of Lahore, Abdu-Samad for his inability and sent his own forces for to help. Baba Banda Singh Bahadur and his forces were at Gurdaspur. He occupied a Kachi Garhi (a dilapidated four walled area) of Duni Chand at Gurdas Nangal. 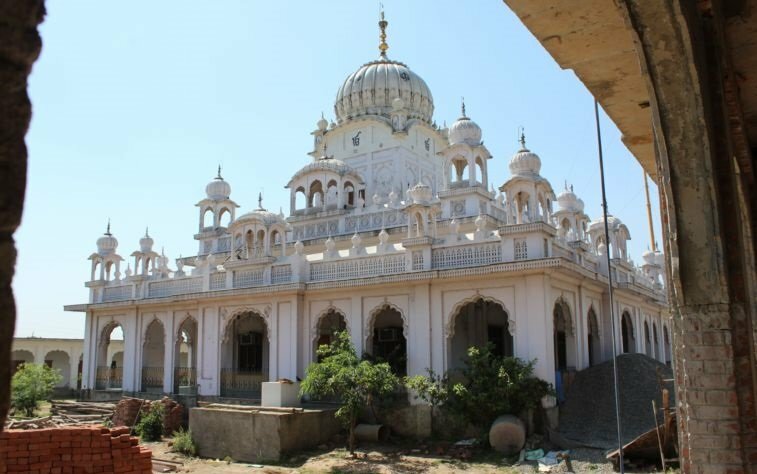 The Gurdwara is Bhai Duni Chand's Haveli earlier known as Bande Wali Theh. It is about one mile from the present village of Gurdas Nangal. A brief life history of Banda Singh Bahadur is written on a huge board which is displayed in front of Gurudwara. It was here around Duni Chand's haveli that Samad Khan, it was said, put such a cordon around the Sikhs that, "not a blade of grass or a grain of corn could find its way in." The Mughal forces dared not even to attack this Kachi Garhi and surrounded it for 8 months. Baba Banda Singh Bahadur only had a small number of men with him and a limited quantity of weapons and food. The mughals had cut off all supplies. A number of Baba Banda Singh Bahadur's men fell ill and stomach cramps. Weakened by a siege of eight months and nearly starved, the Sikh defences failed. The royal troops at last broke through and even at this stage the Sikhs offered heavy resistance. It is said Baba Banda Singh Bahadur alone had killed about 50 to 60 soldiers of the mughal army before he and his famished Sikhs were captured (17 December 1715). Under the orders of Samad Khan over two hundred of the prisoners were executed. The rest, including Banda Singh and his family, were put in chains and taken to Lahore, then to Delhi. Hazi Karam-war Khan writes in his book 'Tazkiratu-Sulatin Chugtian' that arrest of Baba Banda Singh Bahadur and his men was not the result of wisdom or bravery of the rulers, but it was the Grace of God that Kafir (non-muslim) Baba Banda Singh Bahadur and his men were weakened by hunger. The mughal forces were relentlessly pursuing Baba Banda Singh Bahadur and they laid siege to the Gurdas Nangal Garhi for eight months, at the end of which Baba Banda Singh Bahadur was captured along with his companions. Gurdwara Sri Banda Ghat Sahib was the ashram of Madho Das Bairagi (who became Baba Banda Singh Bahadur). In 1708 AD, Sri Gobind Singh met with Madho Das Bairagi at this location. With the blessings of the great Guru, Baba Banda Singh Bahadur joined the Sikh faith, took on the Sikh form and proceeded to the Punjab to tame the tyrants. Guru Gobind Singh, within a few days of his arrival at Nanded, decided to visit Madho Das (according to Bhat Vahi sources, on 3rd September 1708) at his ashram. Madho Das was not in his hermitage and the Guru decided to wait for him. It is said that in order to test the Bairagi's mettle, the Guru deliberately provoked him by having two of Madho's goats slaughtered and cooked. This naturally put Madho Das beside himself with anger, he returned to his hermitage and found trespassers and the sacrillege (Madho was a lifelong vegetarian, his goats were both companions and providers of milk), and he at once attempted to better the Guru and bring him to his knees, but finding he could not mentally overpower the Guru. Full of rage, he shouted, "Who are you and why have you entered my ashram?" The Guru calmly replied, "You have all the power, you should know". Madho Das said that he knew nothing about him. The Guru asked him to be calm and think it over. After some time, he said "Is it true that you are Guru Gobind Singh?". The Guru replied, "Yes I am, now tell me, who are you?". Madho Das at once said, "I am a simple banda (man)". Guru Gobind Singh asked "Whose banda?" and Madho Das replied, "I am your banda". Banda also means a good human being. The Guru said, "If you are my banda, then work you will work as a good banda should." Madho Das assured Guru Sahib that he would follow his advice. The Guru blessed him and raised him to his feet. He later administered Khande di Pahul to Madho Das and renamed him Gurbakhsh Singh (although the name Banda Singh Bahadur remained). During the next four weeks, the Guru instructed him in the essentials of Sikh faith, assessed his potential as a leader and briefed him about his impending mission. A few days before the attack on Guru Ji, Banda Singh was on his way to Punjab accompanied by Five Singh's whose counsel, the Guru commanded he was to heed, although he would be the supreme commander in the impending campaign. 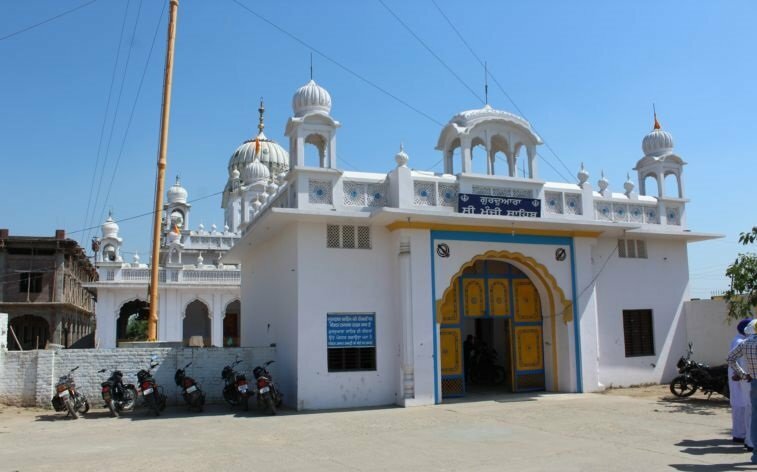 Gurdwara Sri Banda Ghat Sahib was housed in a single square room with a covered circumambulatory passage around its exterior. The Gurdwara has been reconstructed and modified. 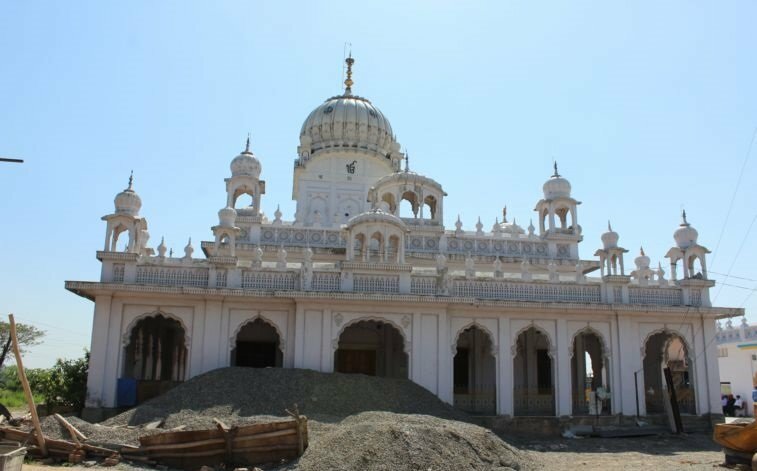 This Gurdwara is in memory of Baba Banda Singh Bahadur, unfortunately we have no further information at the moment. After various conquests and victories against the mughals and hill Rajas that betrayed the Sikhs, Baba Banda Singh Bahadur along with Mata Shushil Kaur, Mata Sahib Kaur and some other Sikhs settled at a lonely place on the bank of the river Chenab, in the Jammu state. 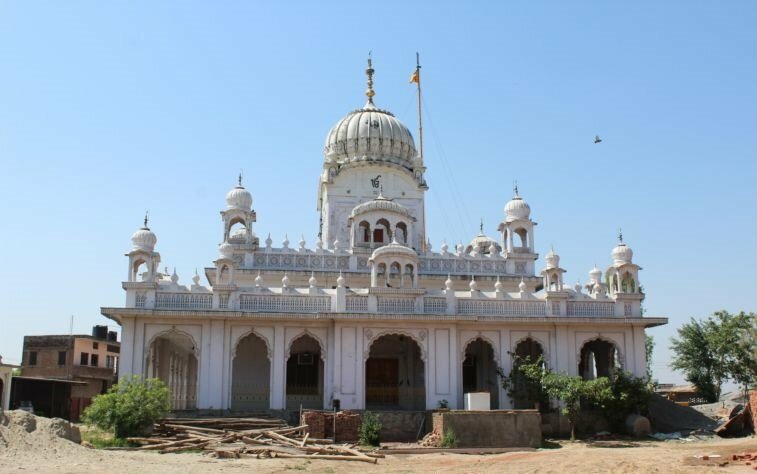 The location is known as Dera Baba Banda Singh Bahadur. Besides having ashes of Banda Singh Bahadur, the Gurdwara also has an arrow, a huge sword and some weapons given to Baba Banda Singh Bahadur by Guru Gobind Singh. Annually, thousands of Sikh's visit the Gurdwara all year around, especially during the occasion of Vaisakhi. 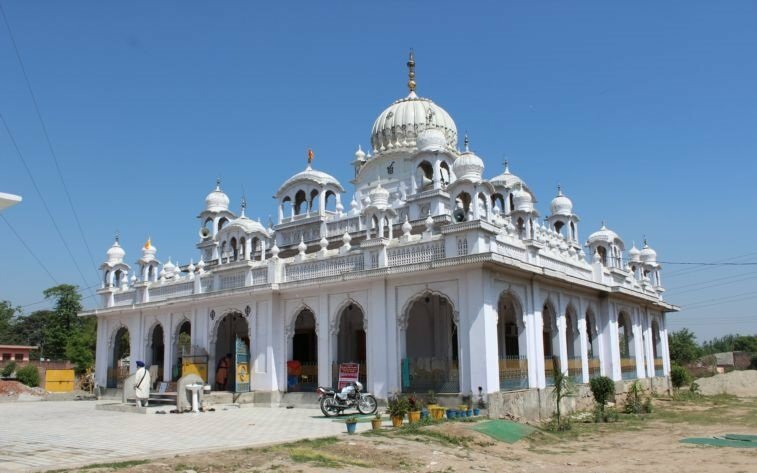 Gurdwara Sri Manji Sahib Shahabad is situated in Haryana. When Baba Banda Singh Bahadur returned from the area of Takht Sri Hazur Sahib on the hukam of Sri Guru Gobind Singh, he camped at this location and freed Qila Mastgarh from the mughals. From here Baba Banda Singh Bahadur continued into Punjab on his mission. 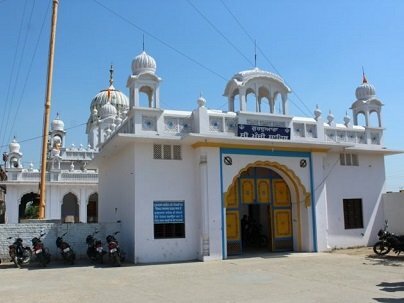 Gurdwara Sri Partapgarh Sahib is situated in village Bhatwan Teh and Distt Pathankot. Baba Banda Singh Bahadur stopped here on the way to Chamba. Baba Ji stayed here for some time to rest, pray and mediatate on God's name. This location has a great vantage point and is very scenic. Gurdwara Sri Shaheedi Asthan Baba Banda Singh Bahadur was where Baba Banda Singh Bahadur, his 4 year old son, Ajai Singh, along with forty Sikhs were tortured and executed by order of the mughal ruler Farrukh Siyar on 19th June 1716. Baba Banda Singh Bahadur was firstly taken through the streets of Delhi to the shrine of the Sufi Saint Khawaja Bakhtiar Kaki in Mehrauli. Baba Banda Singh Bahadur was then paraded around the tomb of Emperor Bahadur Shah. He was offered the usual choice of death or conversion to Islam but like all his companions he chose death. Baba Banda Singh Bahadur was ordered to kill his own 4 year old son Ajai Singh but he refused. Baba Banda Singh Bahadur's innocent son, Ajai Singh was butchered and his heart was thrust into Baba Banda Singh Ji's mouth. Baba Ji's eyes were gouged out with a knife and his left foot was cut off. Baba Ji's body was hung on the gate and his flesh was torn off in bits with a pincer in an attempt to inflict extreme pain and torture. After Baba Banda Singh Bahadur's body was mutilated with red hot rods, he was dismembered limb by limb. Exactly three years later the Saiyid brothers saw to it that, what one might call Divine retribution, caught up with the Emperor who had ordered the murder and beheadings of untold thousands of Sikhs besides Banda Bahadur and his conpanions. Farrukh Siyar was deposed, imprisoned, blinded and ultimately killed in a very ignominous manner on 28th April 1719. A 50-foot high pillar of stone over-looks the Dargah of Khwaja Bakhtair Kaki which now houses a Gurdwara in the memory of the supreme sacrifice made by this great Sikh hero. The pillar still has the steel hook from which, it is believed, he was hung and tortured. There is another Gurdwara in an improvised room in the courtyard of an adjoining site. Today it lies amid ruins.